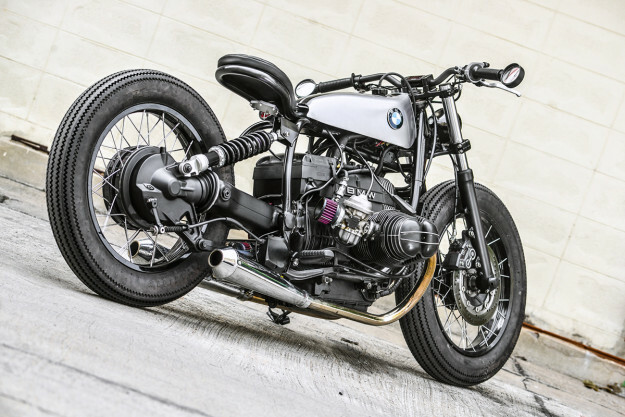 Why are boxer BMWs so popular in the custom world? Availability is often cited as a reason: they’re tough and plentiful. But this is only true in some countries. In Thailand, for example, old airheads are very hard to come by. 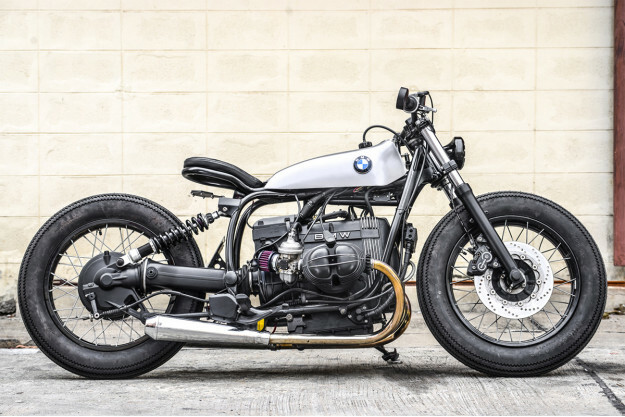 Customized examples are even rarer in mainland SE Asia, since most owners opt to keep their bikes stock. 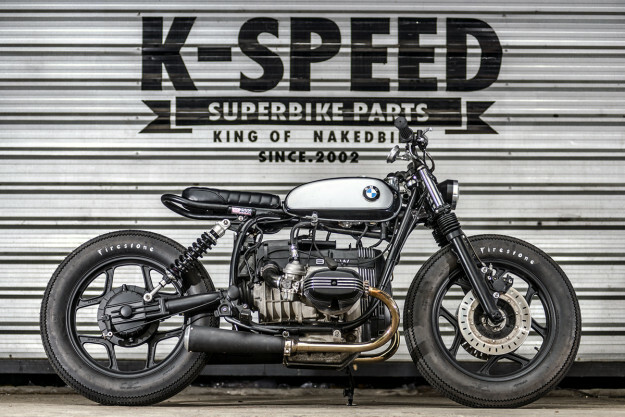 So these two stunning boxers from K-Speed are a real delight to see. 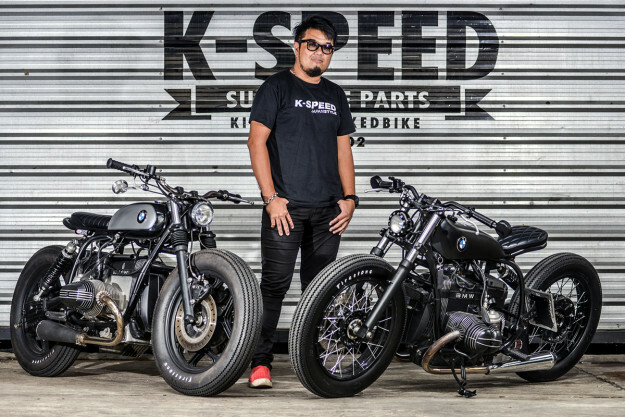 Based in Bangkok, K-Speed is an established parts and accessories store with branches across the country. 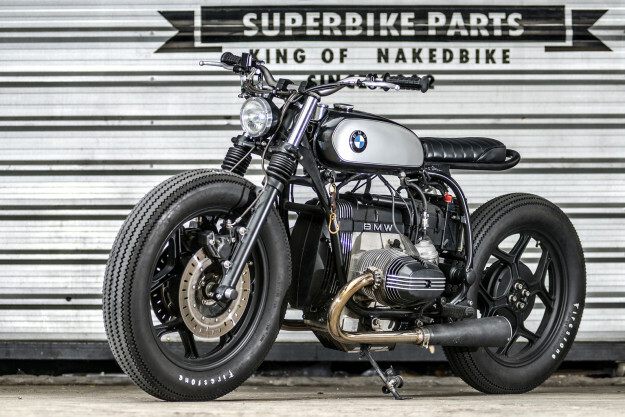 The owner goes by the name of ‘Eak’ and customizing bikes is his creative outlet. His partner Krieng picks up the story. 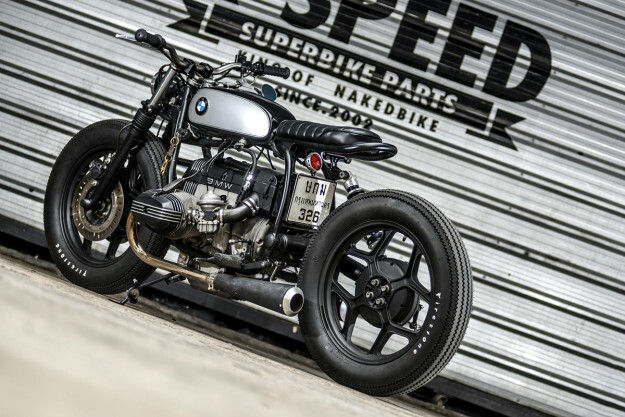 The bikes he’s referring to are a 1991 BMW R100R, and a 1985 BMW R80. And K-Speed’s done remarkable work on both. 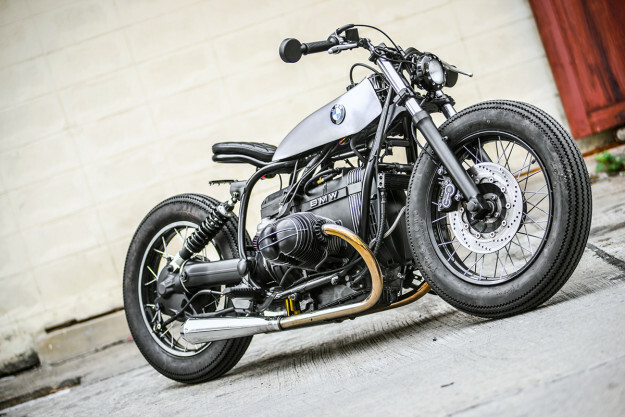 First up is the R100R, dubbed the ‘R100 Bobster’ (above). 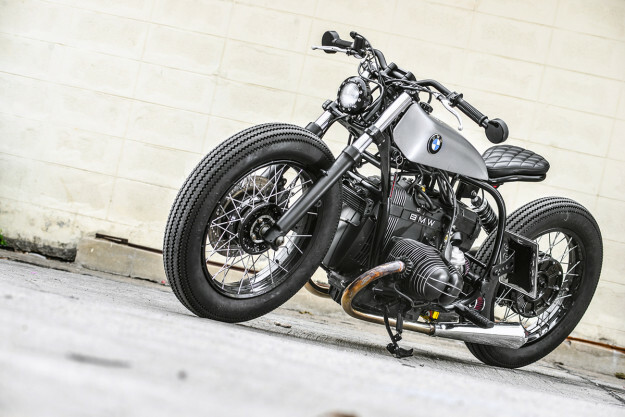 It’s as bobbed as they come, with a chopped rear end and a floating solo seat arrangement. 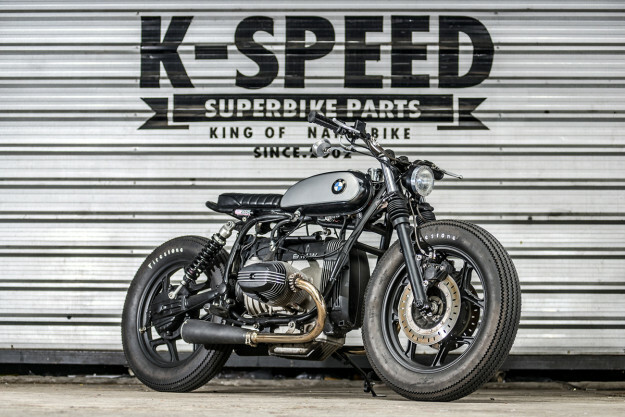 K-Speed have slammed it too, by lowering the front forks and fitting a YSS shock out back. An 18” rear wheel’s been sourced to match the stock 18” front wheel—both are wrapped in Firestones. 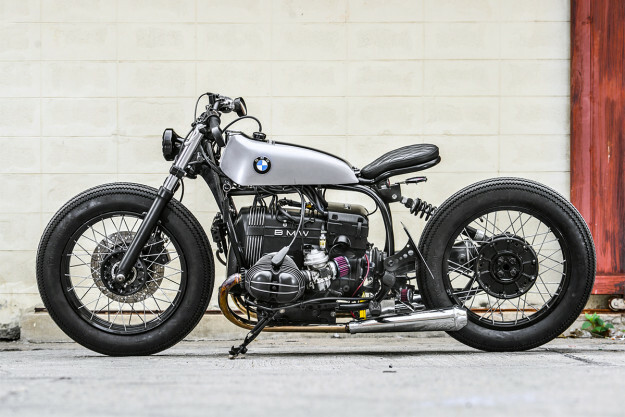 The Bobster’s most distinguishing feature is its wavy fuel tank—borrowed from a Honda TL125. Other bits include low-slung bars from the K-Speed catalogue, with Takegawa controls, minimal switchgear and a tiny LED speedo. There’s a small headlight up front, with a new tail light peeking out from below the seat. On the engine side, the boxer motor breathes through K&N filters, with a pair of megaphone mufflers capping things off. This time, K-Speed lowered the forks a tad less (the rear shock’s another YSS unit). And the seat and subframe are a little more substantial. The tiny tank on the ‘Brat Bobber’ is a custom-made piece, but the bar and control combo is the same as on the ‘Bobster’. The new speedo, headlight and tail light are different parts though. K-Speed left the airbox intact this time, fitting slightly shorter megaphone mufflers. Both bikes have been painted in monochrome schemes, right down to some thorough refinishing work on the engines. 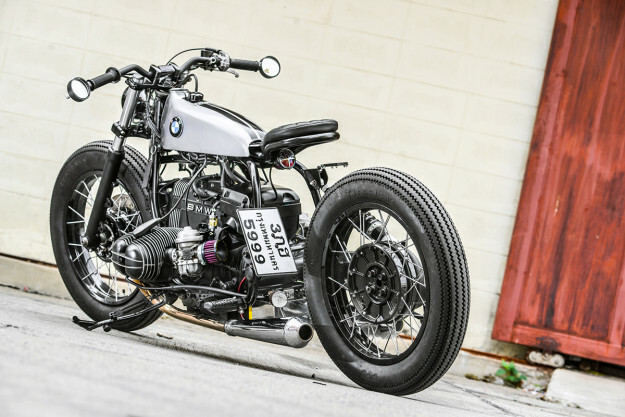 And both fuel tanks are adorned with BMW roundels—a nice little hat tip to each bike’s heritage. Finishes aside, these are not ‘precious’ builds. There’s a slight air of roughness to each, with just a dash of impracticality (note the lack of fenders). But that’s just how we like our bobbers.